Photo Restorations by Tim G. | Breathing new life into old photos since 2012. 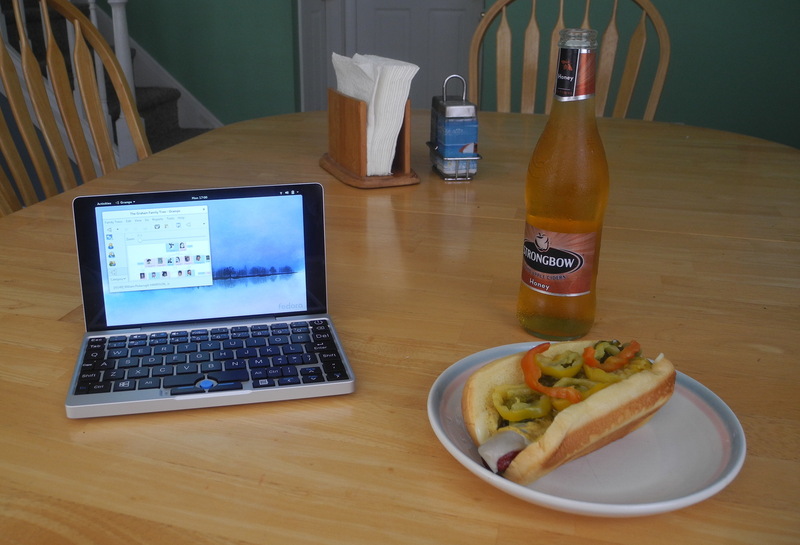 The GPD Pocket, with hot dog and Strongbow shown for size reference. As you may have noticed, I haven’t been posting a lot lately. This is due to my pursuing other ventures in the winter and spring that have reduced my productivity with regard to photo restorations. These have mainly been substitute teaching jobs in the School District of Philadelphia at such fine educational establishments as the U School in North Philadelphia, The Fitzpatrick School, and Swenson Arts and Technology High School in the northeast. For the summer, I have accepted a position as a computer aide at the Avalon Free Public Library at Avalon, New Jersey. This will be a great opportunity for me to share my computer knowledge with the public every weekday. The Avalon library also has a subscription to Ancestry.com, so I hope the patrons come with plenty of questions about researching their family’s history! With these other ventures going on, I unfortunately will not be accepting photo restoration requests, at least for the summer and perhaps longer depending on the teaching work I arrange for the fall. Thinking of what I might to with the proceeds of all this work, a more powerful computer and a wider format printer might be in my future? Well see about that. Until then, thank you to all who have stopped by the site and requested restorations. It has been my pleasure to work for you, and I look forward to the time when I will be able to do this again! In the meantime, stay tuned occasional updates and tutorials on my passing genealogical interests. I hope to stay somewhat active with those.